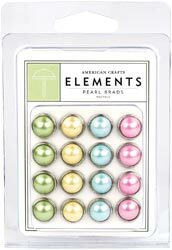 Delicious pearl bradsfrom American Crafts in delicate pastel shades of green, cream, blue and pink with a silver metallic surround. These classic brads will add a touch of elegance to all types of craft projects such as card making and scrapbooking. Each pack contains 16, 1cm diameter brads, four of each colour.